Being a night owl, I rarely see the early morning light. Something rousted me up the other morning though, and despite the numbing chill, I had to step outside to explore. The sparkling clarity of that rising sun could almost turn me into an early riser. magnificent... i was totally taken by this composition and colours. so are you going to get up early from now on? Fantastic capture of both the light and shadow. Inspiring. Beautiful painting with its unusual composition and atmosphere! Wow! this one is outstanding. You captured the contrast between the cool shadowed areas with the rising sun so convincingly. "magnificent" is the right word for this painting. Thank you, Rahina. Up early?...umm...no. William, your encouragement means a lot--thanks. So glad you like it, Pierre--thanks! Marilyn--many thanks for the visit and your thoughtful comments. This is gorgeous - the foreground shadow sets off that light in the distance and just makes it glow. Love it. Thanks for coming by and leaving those kind words, Laurel. This looks really great, Don! 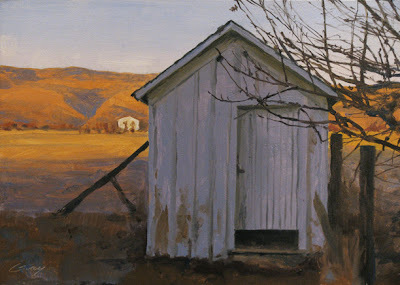 I love the golden hills in the background and the shed almost looks photorealistic! Very rustic, timeless, and detailed! Dean, thanks so much for those compliments. I appreciate your visit. Love the different colours of light. Wow, Don! This is wonderful. Love the shadows, and that golden light on the hills and field. Magnificent, indeed. Hi Takeyce--good to hear from you and thanks for the kind words.